UFO SIGHTINGS DAILY: UFO Disk With Black Dome Near Space Station On Live Cam, Nov 2015, Video, UFO Sighting News. 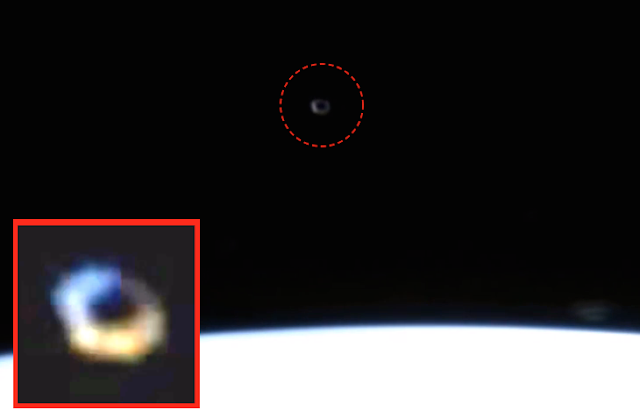 UFO Disk With Black Dome Near Space Station On Live Cam, Nov 2015, Video, UFO Sighting News. This donut UFO was caught by Streetcap1 of Youtube this week. Its a common shape for UFOs near the station. The dark center is not a hole, but a dark dome over the top of the disk. The disk is tilted at an angle to the space station for a better view. This is the first ISS catch I have had for a while. Whatever the circular object is, it leaves before the others.